I was surprised today to see that one of the Facebook ads I had created for one of my Facebook Pages had been “Disapproved” with no specific reason given. This ad has been disabled and should not be run again on the site under any circumstances. Unfortunately we cannot provide you with the specific violations that have been deemed abusive. Please review our Terms of Service and Advertising Guidelines if you have further questions. 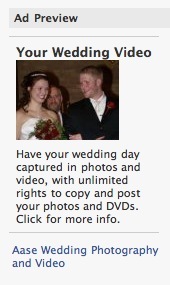 The text and/or image of this ad violates part or all of sections 4, 5, and 6 of Facebook’s Advertising Guidelines. 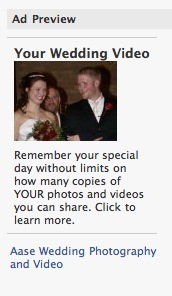 Remember your special day without limits on how many copies of YOUR photos and videos you can share. “Abusive” seems a little strong as a description of what I did. But now I’ve changed the language a bit and gone to lowercase, so hopefully Facebook’s inscrutable judges will be apppeased. They haven’t disapproved this one yet.